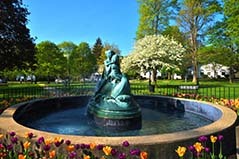 Wellsboro, the county seat of Tioga County, offers quaint gas-lit Main Street with boulevards, well-kept homes, spacious lawns, and stately trees. Wellsboro is home to the Pine Creek Gorge, better known as the Pennsylvania Grand Canyon which is 50 miles long, more than 1,000 feet deep, and embraces 300,000 acres of State owned forest land in north-central Pennsylvania. Lookouts on the Grand Canyon at Leonard Harrison and Colton Point State Parks offer 40-mile views. 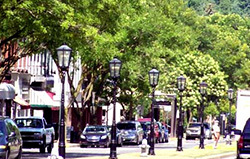 The Wellsboro Area Chamber of Commerce hosts many events and activities throughout the year, including: Mary Wells Days in May, the Susquehanna Trail PRO Rally, the PA State Laurel Festival in June, the Classic Car Cruise-In in July, Wellsboro Rail Days in October, and Dickens of a Christmas in December. The Wellsboro Johnston Airport nearby provides 100LL and Jet Aviation fuels, aircraft parking, hangars and passenger terminal. Fly in and fall in love with our unique scenery and all we have to offer. Please see our Activities and Events page for more things to do throughout the year.